A very special rose. This gift from a friend holds the memory of someone taken much too soon. After a late summer of seemingly endless blue skies, South Head received an unseasonal 124 mls of rain between 08 and 14 March. On the first soggy day we were grateful as the water tank was getting low, but by the end of the second day the novelty had worn off. The rain followed by sun has turned the vegetable garden into a jungle through which I can barely navigate. A tangle of kūmara, melon and squash. In early November, we planted three rows of kūmara tupu. ‘Tupu’ are the rooted shoots that grow on a kūmara tuber. The vines are very vigorous and are spreading all over the garden. I’m very excited about this. We’ve had mixed success with potatoes and I’d much prefer to grow kūmara if possible. We’ll have to wait until the leaves start to die down before seeing what’s hidden in the soil. This could be any time from the end of March onward and looking at our plants I suspect it’ll be more like April. After harvest (assuming there is actually something growing underneath all those leaves) we’ll set the best aside to start a new crop next October. Left to right: Basil jostling with carrots; okra; rhubarb; kale and silver beet (chard, to those of you from the northern hemisphere). Our one surviving rhubarb plant is gigantic. The stalks are fat and juicy and despite baking them into Rhubarb Tarte Tartin and adding them to cereals and desserts, many will go to waste. We also have more than we can eat of basil and silver beet, and I’m curious to see how the okra turns out. Growing okra is another ‘first’ for me, and in my ignorance, I allowed some pods to grow too long, so have cut them all off and am hoping that more will be produced before it gets cooler. Left to right: Limes; habanero peppers; ‘Big Chief Butternut’ squash; bell peppers. Continuing with the green theme, it looks like we’ll beat our record for limes as both trees are very well-endowed this year and also have a decent crop of new flowers. 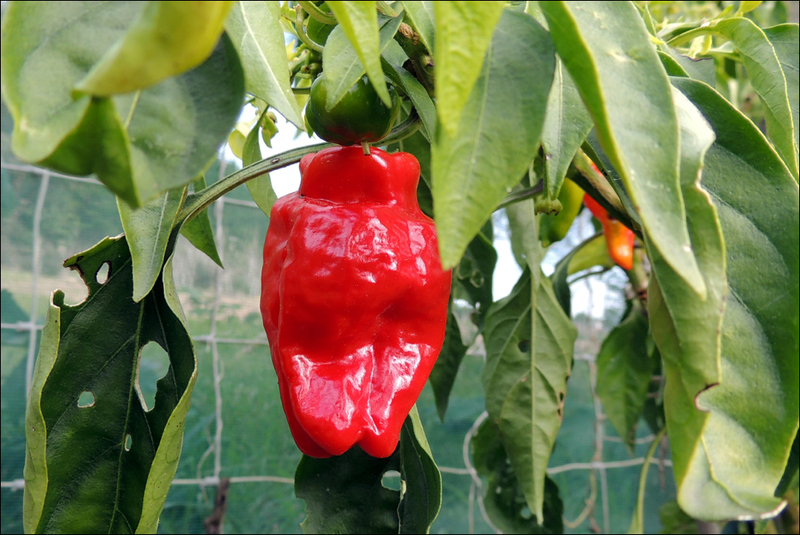 My favourite chile pepper, Habanero, is looking very fine, with each of the plants laden with flowers and young fruit. I also sowed a handful of seeds for a different squash, ‘Big Chief Butternut’, which apparently grows to 2 – 3 kg. And it is HUGE. And the capsicum (bell pepper) plants have become so large that we’ve had to support them with sturdy wooden stakes. This summer we’ve had the heaviest crop of both zucchinis and tomatoes since living at South Head, with green beans, coming a close third. Left to right: Pretty Cleome spinosa (Spider flower); a tomato fruitworm tucking into a green tomato; the disturbing sight of a grub inside a tomato; same grub after removal. Scattered around the vegetable garden are self-sown Cleome. I planted a half dozen a few years back to attract green vegetable bugs and the Tomato Fruitworm, Helicoverpa armigera ssp. conferta. The Cleome attract both insects really well, but there haven’t been so many green vegetable bugs this year, and I’ve been picking off the damaged tomatoes when I come across them. 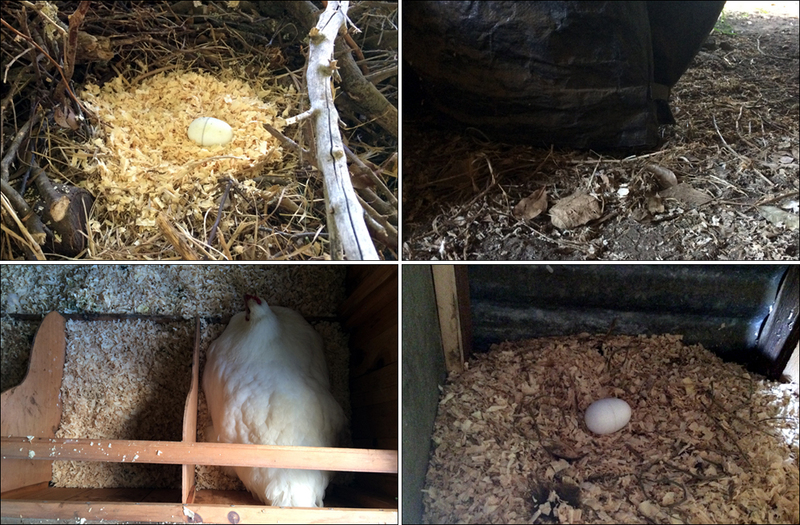 The hens like drawing the fat green caterpillars out. I must admit that when I overlook one, and the tomato goes rotten from the inside, I can’t bear to look at them, let alone touch them. All that ‘goopy’ decay turns my stomach. I’ve been freezing tomatoes in 400 gram packs for use over winter; the neat thing about outside-grown tomatoes is that they are easy to peel, which saves time later. And I’ve also bottled a batch of tomato sauce. I’ve used the zucchini for pickles and we’re eating them every other day. My favourite recipe is to slice them thickly before sautéing them with mashed garlic in a little olive oil. At the last moment, to throw in a few sage leaves. Because the Costasta romanesco variety of zucchini isn’t at all watery, the sage leaves quickly go crispy and add a delicious flavour. There are some vegetables I haven’t really bothered with… lettuces, for example. We rarely get around to eating them and while I do have a row growing and gradually aging right now, there are several earlier plants that I’ve let go to seed; the fuzzy down drifts around the garden with the slightest breeze. Lettuces are unlikely to become a problem if they sprout everywhere… I allowed a golden turnip plant to go to seed in Spring and we now have them growing in a couple of the pathways. There are only single rows of beetroot, carrots, parsnips, golden turnip and rocket – not that you’d ever need any more than one row of rocket! Left to right: Asparagus still sending up shoots; zucchini Costasta romanesco; parsley; bulb fennel. Yet another amazingly productive crop we’ve had this season is grapes. The vine stretches along the sun-drenched, north-facing wall of the barn and I’ve never seen as many. We can’t keep up with eating them, so they are all beginning to split and ferment on the vine. Grapes are particularly attractive to honey bees – more so in the morning, and in the evenings I’ve seen the German wasp, Vespula germanica hovering around, so I’m hoping to observe them at dusk at the end of one of the fine Autumn days we have ahead of us, to see if we can ascertain the location of their nest. The picked grapes are sweet and juicy. In about a week’s time I’m heading to Asahikawa in the north of Hokkaido for about five weeks. The contrast in weather will be a shock, I’m sure – going from the mid 20s to low 30s Celsius to close to 0 degrees (at least, for the first week or so), but I’m very much looking forward to my very first visit to Japan and am planning on writing about my impressions while I’m there. Because I won’t have the distraction of the garden, I should have much more time to write, which will be something I’m really looking forward to. Dahlia ‘Cactus Colour Spectacle‘ growing against the old fence. or… how to wile away an afternoon instead of working on your current writing project. This week is Te Wiki o Te Reo Maaori, hence my attempt at dual headings. The macrons don’t seem to always display that well, so in same cases I’ve reverted to double vowels. From the day I first tasted a pickled jalapeno on a pizza, I’ve always loved chiles. Very early on I was a member of a chile pepper Usenet newsgroup – this was back in 1994/1995, and a time when the internet as we know it now, was still in its infancy. You weren’t able to browse gazillions of web pages then, nor purchase unusual chile seeds online. A friend sent me some Habanero seeds by snail mail, all the way from the US. Of course, it was probably illegal to do this, but I didn’t think about such things back then, I was just so keen to try them. I nurtured the precious plants under plastic in my (then) Dunedin garden. A chile plant in July at South Head. I have grown Habanero, Jalapeno, Serrano and other assorted peppers continuously, since moving to South Head. In fact, my plants are still bearing chiles, out there in the cold, wintry conditions… They are so prolific that by the end of a season, I get somewhat lazy about harvesting them. 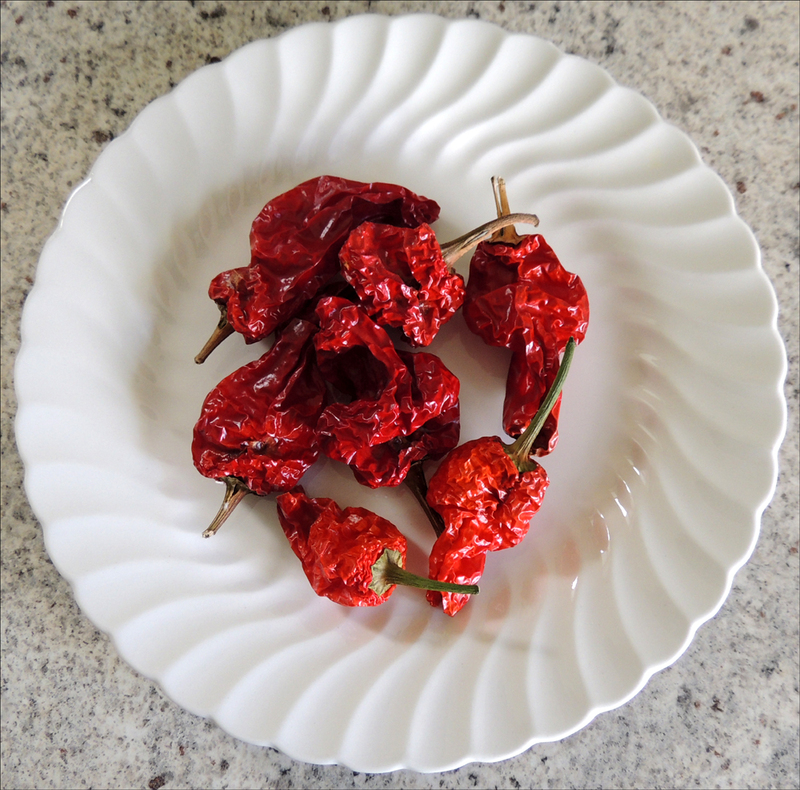 My usual practice has been to pick the chiles when they are fully ripe, wash and dry them thoroughly, then freeze them whole. This is an excellent way to store these jewel-like fruit as you can just take one out and slice off a chunk when you need it. The problem is, we can never keep up with eating them and there are bags of them in the freezer – some going back a couple of years. They don’t seem to deteriorate. This year I thought I’d try preserving some by drying. I’ve seen those neat little jars in home ware shops – the ones with a glass body and a stainless steel screw-top lid with holes. 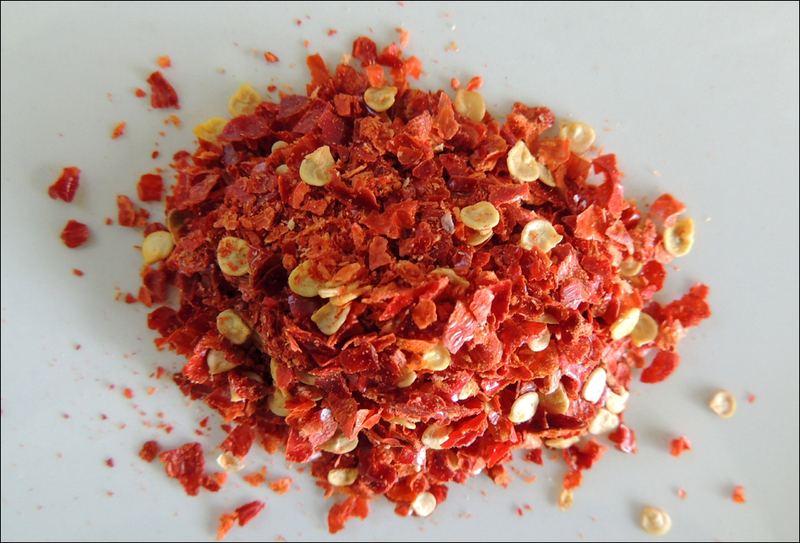 Dried chile is such a beautiful colour, how nice it would be to have our very own flakes or powder, to use as a condiment. Chile peppers strung up in the barn. I wouldn’t say that my technique was completely successful. I diligently harvested a mixture of Habanero and Caribbean Red Habanero, threaded them on strings, and strung them up in both the barn and the hot water cupboard. I kept a few back to use fresh – they were in a rourou on the bench, then forgot about them. Amusingly, a few weeks later, I noticed that these were starting to dry quite well, so I put the rourou into the hot water cupboard as well. Today I decided it was high time to do something with these peppers. Every time I went to put some linen in the cupboard, I had to push it behind the chiles rattling on their strings. Interestingly, I discovered that the peppers that had dried the best, i.e., had no mouldy-looking discolouration, were actually the ones in the rourou. I discarded any that didn’t look good enough for my high standards (!) This reduced my stock by at least 50%. I then trimmed the stalks off the others and nuked them in my blender/grinder. 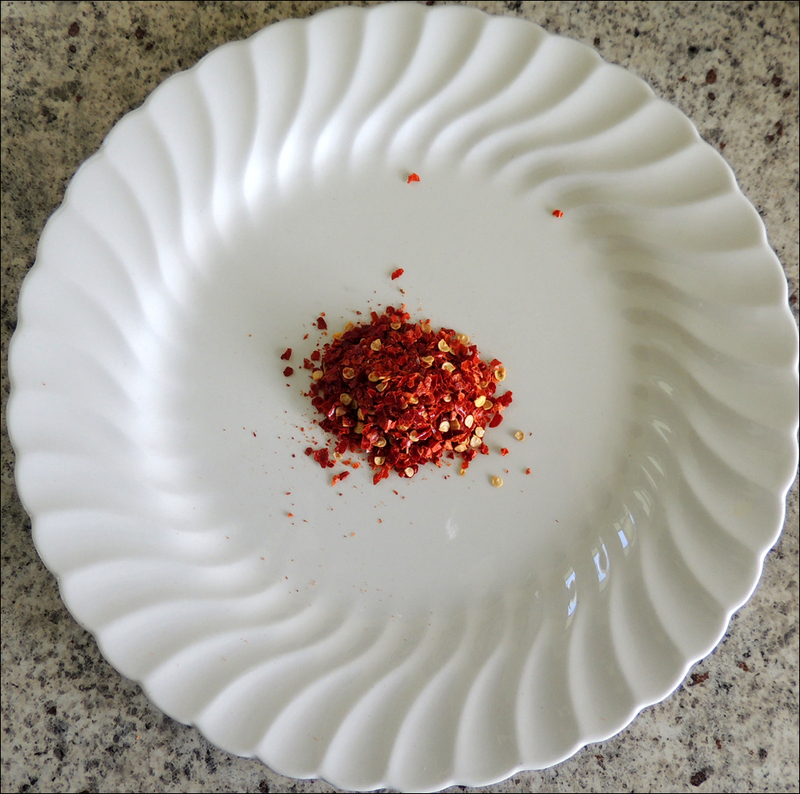 The result is a lovely HOT product – a chili powder/flake, which will be ideal to sprinkle on foods, or to add at the cooking stage – IF YOU DARE. I was using a pastry brush to sweep out the last powdery residue from the grinder – didn’t want to waste any – and inhaled some. Yowsa it was hot, and I coughed for about five minutes. This is the recipe that we use, but I can’t find where I sourced it, unfortunately. I also found this recipe on the net. It sounds much hotter – perhaps we’ll check it out tonight. In a cocktail glass muddle the habanero to release some juices. Do not pulverise. Keep the pepper in the glass, or remove it for a (slightly) lesser heat. Combine over ice the tequila and vermouth. Shake well. Then pour the mix over the muddled habanero. The Habanero Martini recipe is borrowed from PepperScale’s site – lots of neat recipes there. Kō tēnei Te Wiki o Te Reo Maaori! 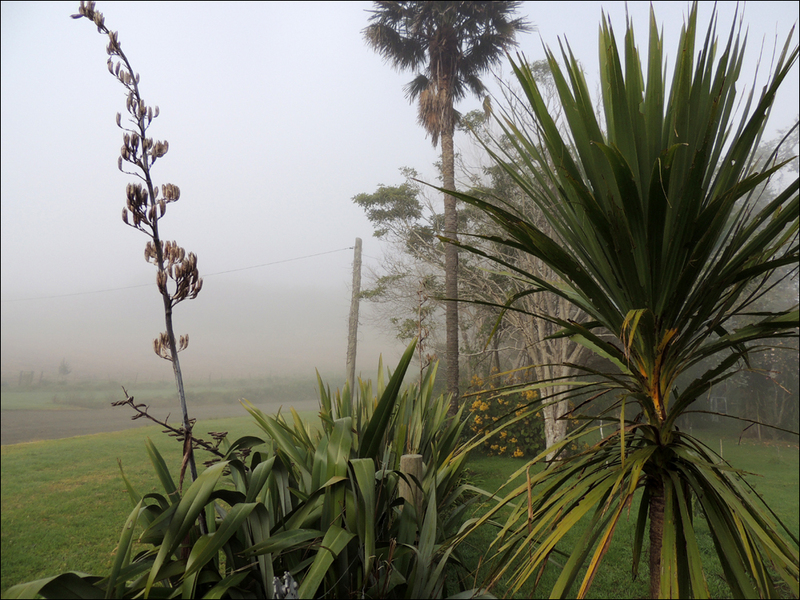 It was foggy when I awoke this morning, and a rather chilly 7 degrees Celsius. 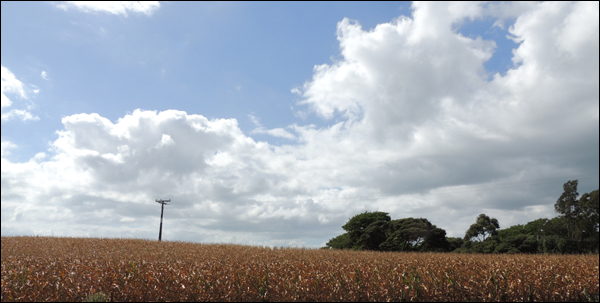 The paddock next door glowed a mellow brown against the leaden sky. 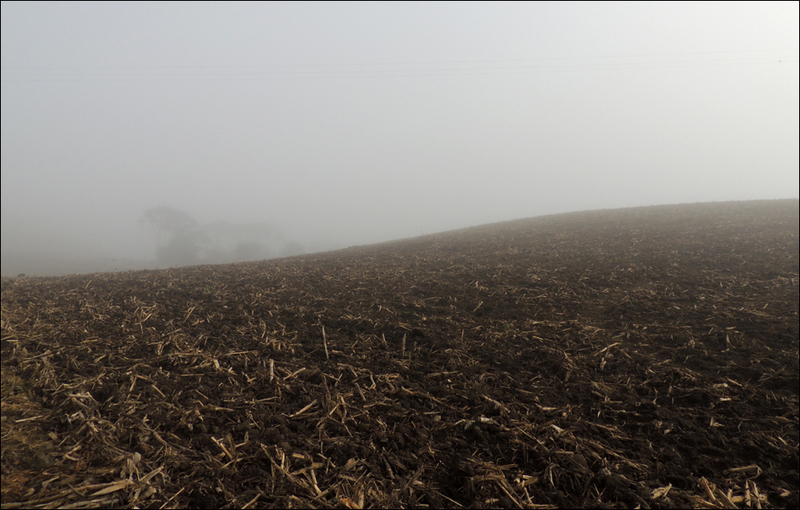 It had been freshly-plowed a couple of days ago and the rich earth bristling with broken maize stalks reminded me of a rough slice of dark rye bread. I walked a circuit of the property several times (my usual practice). This combines exercise with the chance to see the myriad changes in the garden from the previous day. What captured my attention today was the texture of the light through the mist and the way it picked out the delicacy of the tiny things it touched. For example, I saw the work of countless orb-web spiders. Their intricate webs are strung from fence wires, dangling from branches and woven between the leaves of the harakeke and other native shrubs. 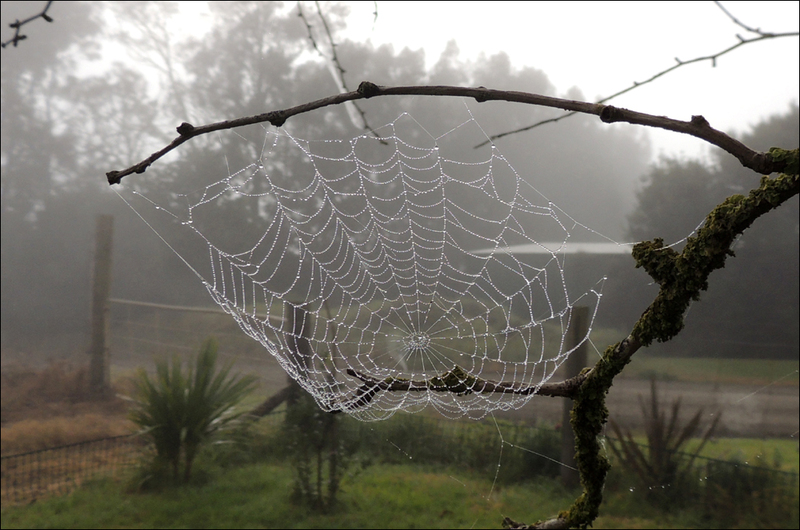 This morning, each web was heavily laden with tiny drops of water. At first glance, the garden appeared to be clothed in muted greys and pastels. Paradoxically, as I drew close to them, trees and shrubs seemed somehow fresher. They appeared to loom up out of the grey and stood out with greater clarity than I’d noticed on days where there is no mist. All the while, the sun was trying to break through the moisture-laden air. 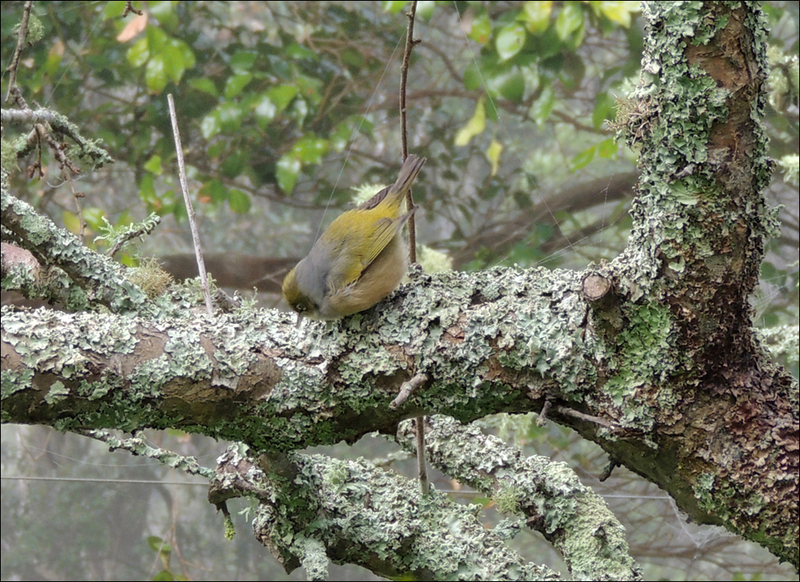 A tiny Tahou fed on small insects on the lichened branch of the old plum tree. I was interested to read in Lynette Moon’s Know Your New Zealand Birds that this pretty little bird is protected. Waxeyes are classified as native, which means they are either naturally found here, or self-introduced; large numbers migrated to New Zealand from Australia in the 1850s. Who is the specimen here? 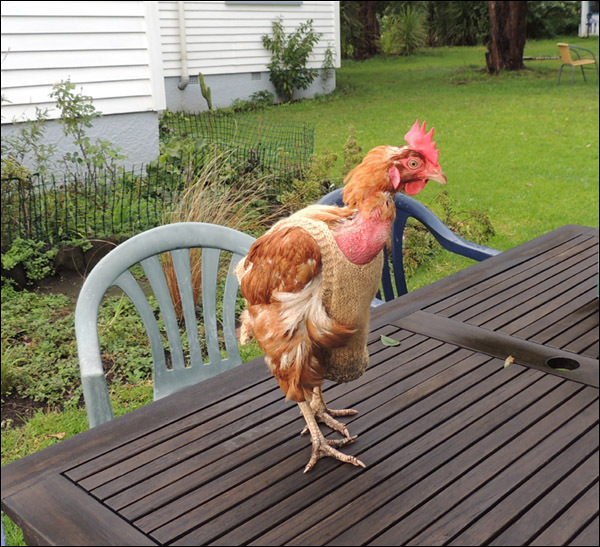 When I came back indoors, several of the hens were on the terrace, looking in at me through the living room window. Sometimes I have the distinct impression that I’m a specimen in a zoo. Molly joined me. 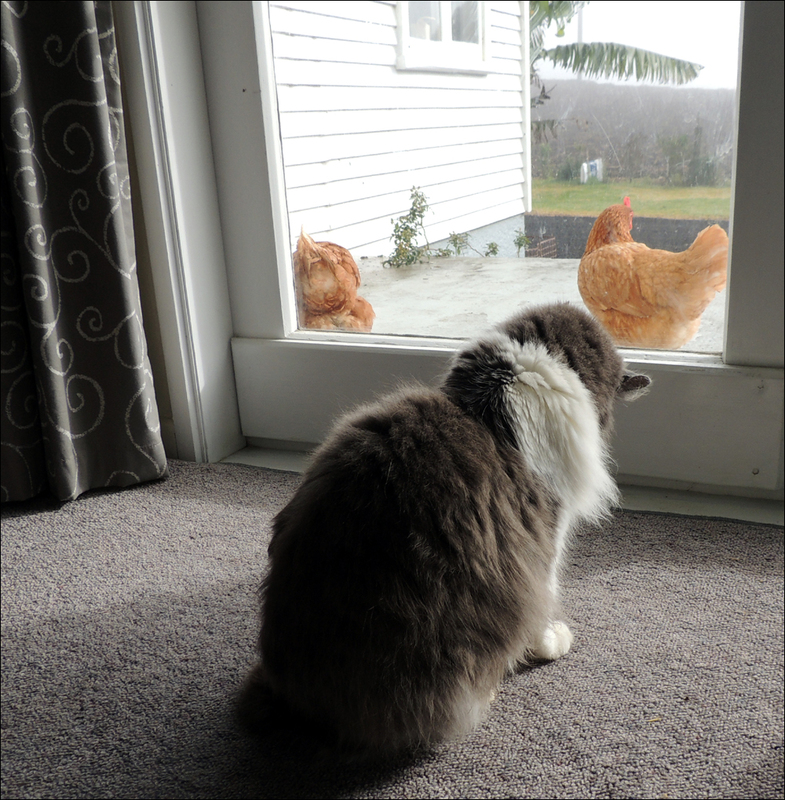 She looked at the hens, the hens looked back. Then they walked away. Slowly. This always amuses me. Had she stared them down? What is the pecking order here? 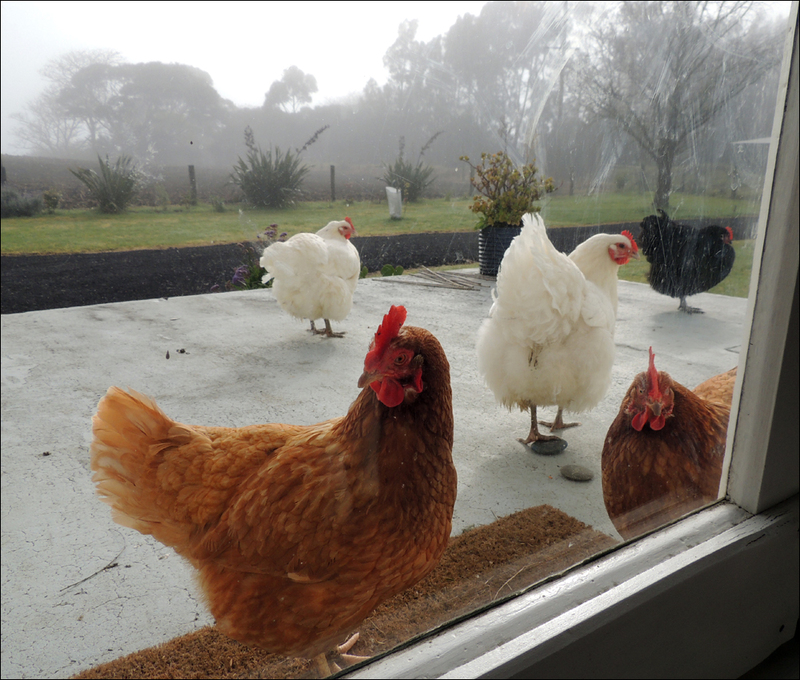 On rainy days when the hens are sheltering near the window, Molly often looks out at them. Sometimes she goes right up to the window and just looks. I’d like to be able to read her mind. Moon, Lynette (2006) Know Your New Zealand Birds New Holland Publishers (NZ) Limited, Auckland. Perky looking out towards where the other hens are scratching. 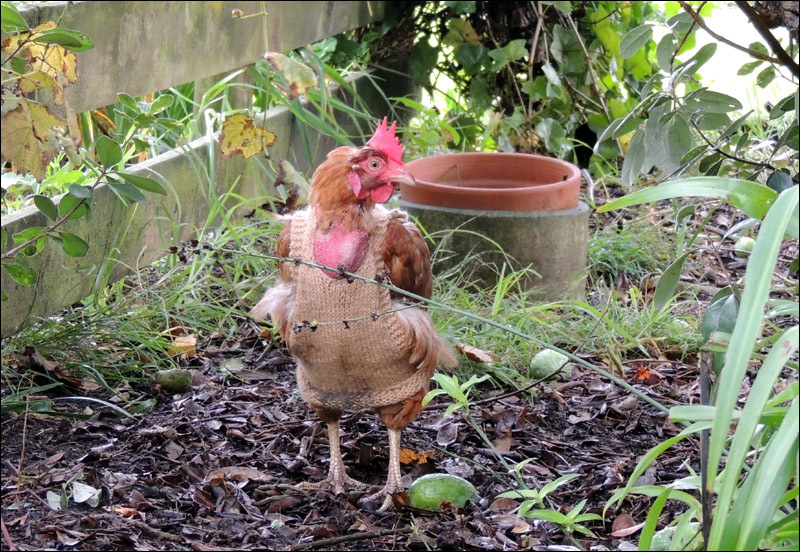 The idea of knitting a little outfit for Perky didn’t work out as we’d planned. And I suspect that Perky wasn’t impressed with the whole process, either. 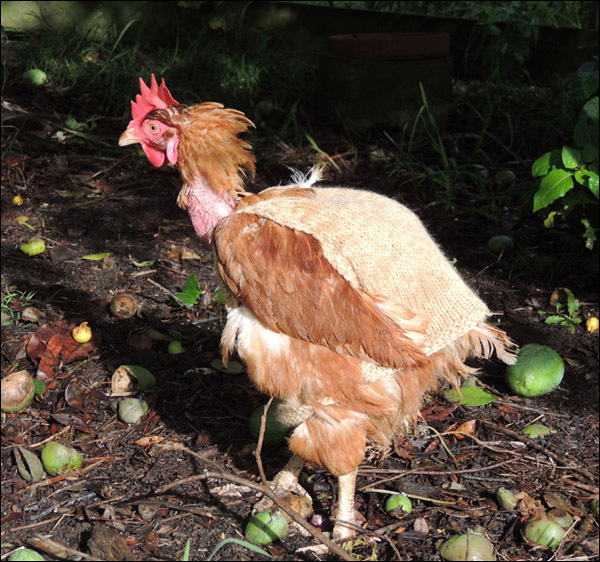 That night, we crept up to the hen house under the cover of darkness, grabbed Perky (who was sound asleep) and while Ben held her snugly, I put the tunic over her head, fastened the two buttons, freed her wings and adjusted it as best I could. Perky wasn’t that impressed but didn’t wriggle much. Ben went out later on to see if she was still okay, and she was sleeping peacefully with the woolly jumper on. So far so good. A disgruntled Perky, wearing her new ‘jumper’. The next day I went out first thing to check and was dismayed to discover that Perky had become entangled in the little outfit. She’d somehow managed to lift one of her legs through the ‘armholes’, where usually only her wings would go. So part of the garment was now under her body and the bottom edge of the garment was wet and muddy and dragging on the ground – of course to make matters worse, it was raining. Dismayed, I managed to corner Perky and pick her up. I stroked her for a bit to soothe her, and then re-adjusted the tunic, ensuring it was sitting correctly and that her wings and legs (and head, of course!) were free. I pulled it up so that it sat nicely below her neckline and set her back on the ground. 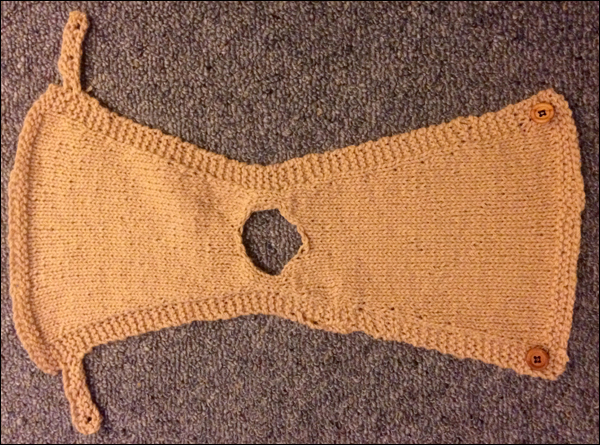 Even after adjusting the tunic, I could see that it was too loose. Thirty minutes later when I went back to check, I could see that the tunic was actually too large for her – she’s such a tiny scrap of feathers. 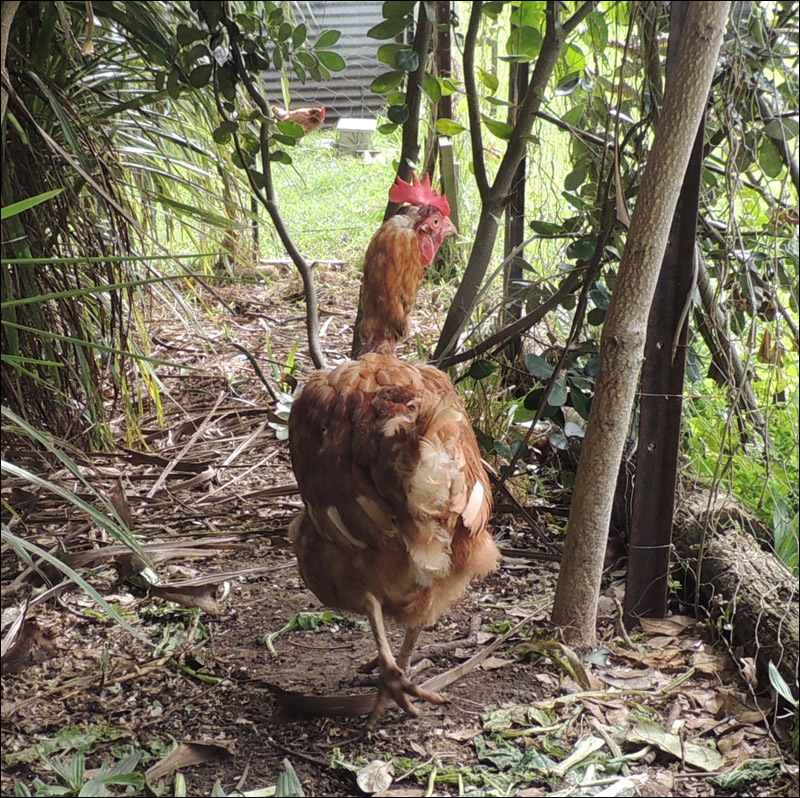 The hem was down to her ‘knees’ (not sure if hens have knees) and it was clearly annoying her – she kept trying to lift her legs to scratch it away with one or other of her feet. Sadly I had to catch her again – Poor Perky, I hate chasing her to catch her when she’s not really tame enough. I gave her some cuddles and removed the offending item. The other three saved hens were still pecking at her bare skin, so on Saturday we applied some Stockholm Tar to the exposed flesh, thinking this would be a good solution. Wrong again. 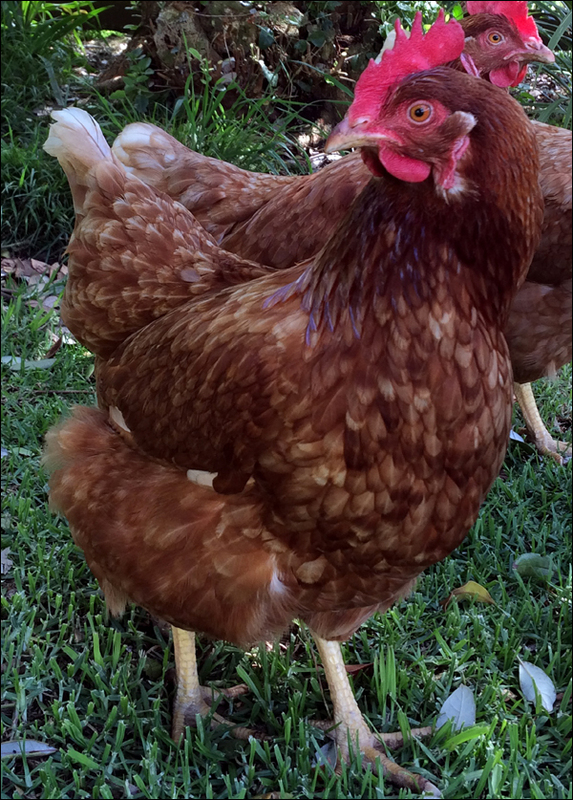 The other hens just pecked it off – we could see who the main culprit was (Crinkle) by the tar on her beak. It doesn’t seem fair that Perky has to be the one kept away from the outside world. 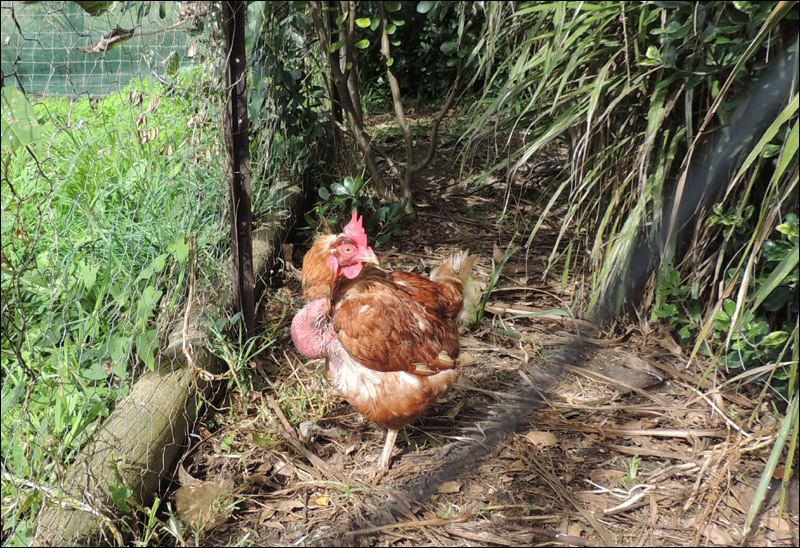 Perky is now all by herself in the rescued hen section of our fenced off area. 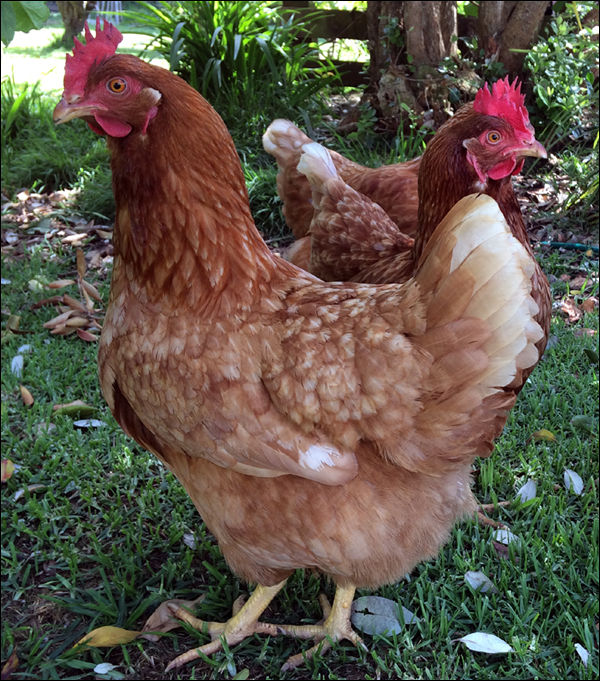 The other three saved hens have been integrated into our main flock and are doing fine. 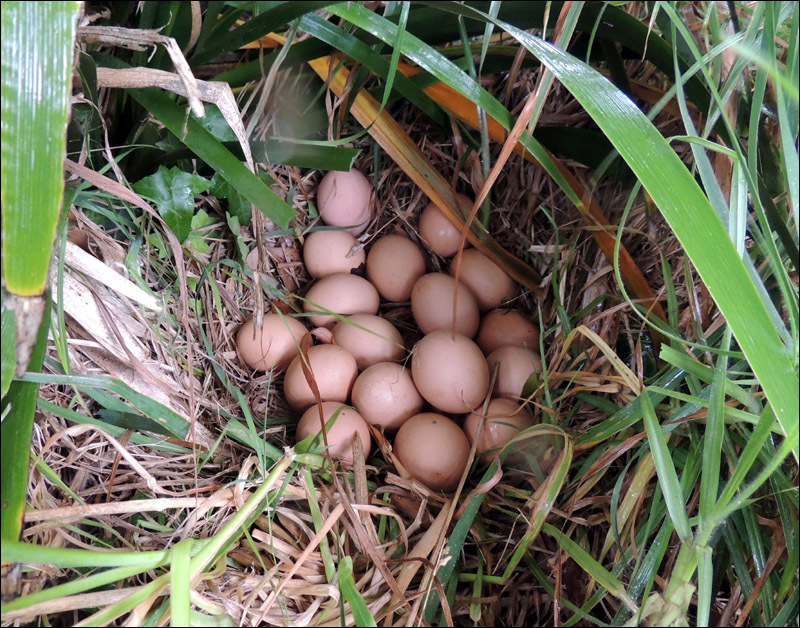 One amusing thing though… while chasing Perky on Saturday to apply the Stockholm Tar, Ben found a pile of more than 30 eggs, all nicely piled up under some long grass. The secret nest area. 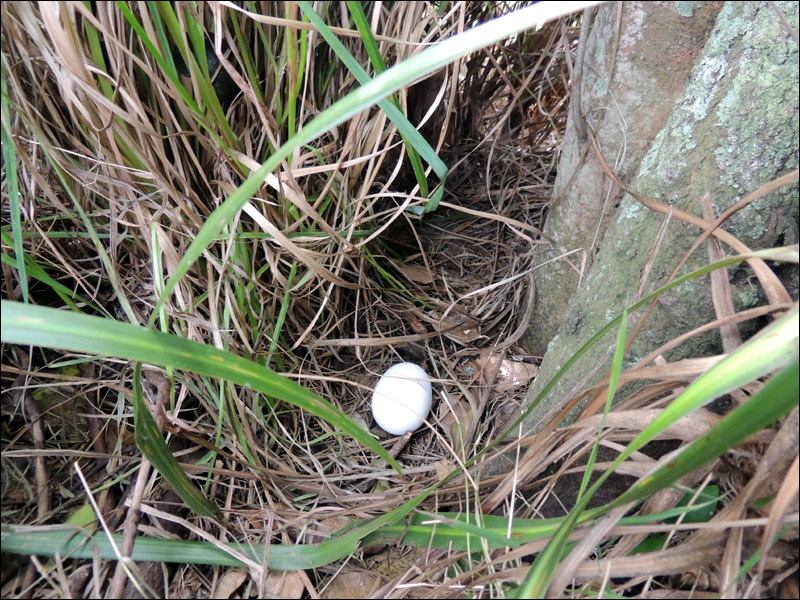 We’ve left a fake egg there so that Perky has something to lay her own egg beside. We checked them all using the ‘will they float in water?’ test, and ended up only discarding about 10. We had visitors over the weekend so have eaten the remainder already. 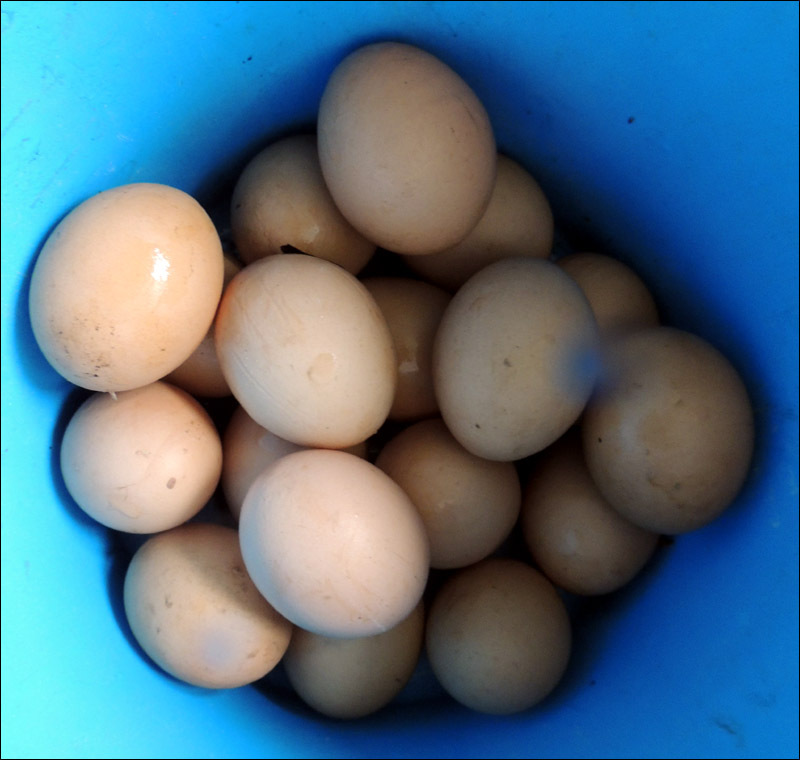 It would appear that all the rescued hens have been laying since we’ve had them. I think that’s ironic considering that the battery farms cull them for going off the lay. The short poem to Perky at the top of the page is a quatrain. A typical March view of the paddock next door. I started this post over a month ago but recent circumstances got the better of me and I didn’t get it finished. Today I’ve made the commitment to at least get something posted – after all, the whole point of a blog is keeping up with it. We’ve had a little rain – just enough to prevent it being declared a drought in our area, unlike some other parts of NZ – but it’s getting very dry now. As I write a large truck has come scuttling down the hill and along the gravel road beyond our gate. Huge clouds of dust drift and settle on our property. I think of the solar panels and how they will most likely need to be cleaned manually if we don’t get a decent rainfall soon. You’d be surprised how much dust settles up there! Or perhaps you wouldn’t. As I write it’s around 1.30 pm and 27 C outside in the shade. By the time the sun comes around it will get very hot where I’m sitting, even with all the windows open. It’s much too warm and humid for me outside at this time of day. The sun just bears down relentlessly – hence the garden is quite neglected. I’m hanging out for cooler mornings and evenings now that it’s Autumn. The garden has still been remarkably productive, considering that until last week (when I put in a row of broccoli and rocket) I hadn’t sowed anything new since December. We are still producing enough vegetables not to have to purchase anything other than the occasional bag of potatoes. 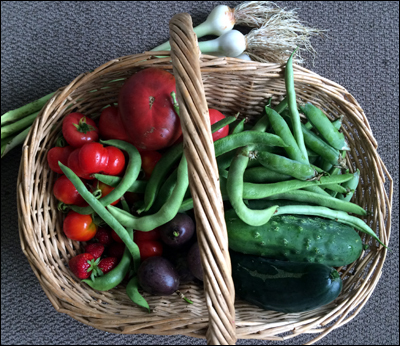 The basket above shows some of the vegetables we’ve been harvesting since I last wrote, but the green beans are finished now. As are the peas and we just didn’t eat any of the lettuces I diligently sowed in Spring and early Summer – they kept going to seed as we were eating other vegetables, so I stopped sowing them. The vegetables we’ve been consuming the most of, lately, have been tomatoes, turnips and zucchinis. The heirloom golden ball turnip is a delicious little vegetable and easy to prepare. A simple recipe I use is to peel them, then cut them into cubes and blanch in boiling water. Drain the water off and saute the cubes in a little oil of your choice until they start to brown in patches, add 1 tbsp butter, 1 tsp brown sugar and 2 tsp apple cider vinegar. Stir through to form a light glaze. Season with salt and pepper and they are ready to eat. The three varieties of tomato that I grew this year are ‘Black Krim’, ‘Mortgage Lifter’ and ‘Bloody Butcher’. Of the three, I definitely prefer Black Krim and Mortgage Lifter. Garlic drying on our back fence and a plate of newly-pulled beetroot ‘Crosbys Egyptian Flat’. We’ve had enough cucumbers to keep us going, but not too many, and of course the usual carrots, rocket, basil… silver beet, beetroot, that we usually have on an ongoing basis. I’ve lifted our almost all the garlic (yes, I know, it’s very late in the season not to have completed this task) and all the Egyptian Walking Onions. We had amazing crops of each of these. The onions are great and we have strung them up to dry out, and the garlic bulbs are very fat this year. We do have a large section of our garden devoted to main crop potatoes but I have a bad feeling about them. We didn’t really realise how much water they require and should have been watering the plants as they developed. We poked around beneath the soil of a couple of plants a few weeks back and they really had nothing much under there, just some tiny, tiny potatoes. Oh well, there’s always next year, I guess. At least we did have a decent amount of ‘earlies’ prior to Christmas. Fruit-wise we’ve had a glut of Passion fruit and are making sure that we each consume several per day so that they don’t go to waste. They are lovely big Passion fruit and are extremely juicy and flavoursome. We still have pulp from last season that we froze a year ago as it was so precious (haha!). I’m definitely not going to freeze any this year. 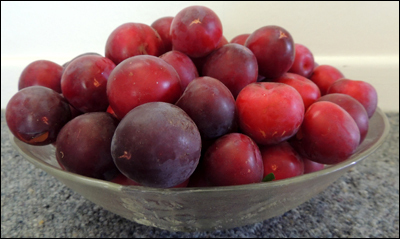 I did manage to process some of our plums in January. We had so many, all ready at the same time, so we halved and froze some for later, ate a great deal and used the rest for jam and plum wine. Plum wine: a new batch and the finished product. 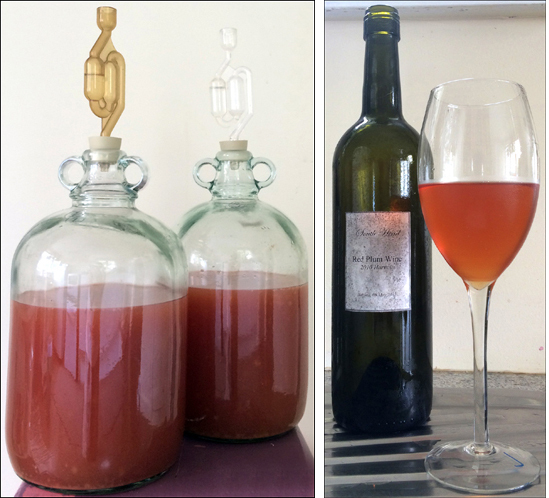 The left-hand image above shows this year’s batch of plum wine directly after the first racking off. 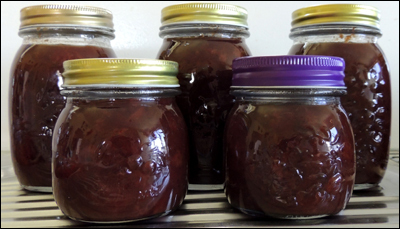 Prior to that I’d fast-fermented the must on the skins for the first few days, to bring through a little of the red colour – the plums themselves are yellow-fleshed. We also opened a bottle of our plum wine from 2010 – we tend to forget that we have bottles of fruit wine in our cellar. It was actually not bad! The jam was basically just plums, sugar and habanero pepper. I had to keep tasting the jam as I went along to ensure it was hot enough (but not too hot! ); I added more habanero as it cooked. It turned out really well. It’s very rich in flavour and ideal either just as jam, or added to casseroles or curries to give them an extra zing. It’s also good with cold meats and cheeses. Nice and spicy! I love the taste of habanero. Well, there’s a sad tale to tell about Molly (it has a happy ending, though). I’ll have to write up what happened in a separate blog or I’ll never get this posted. 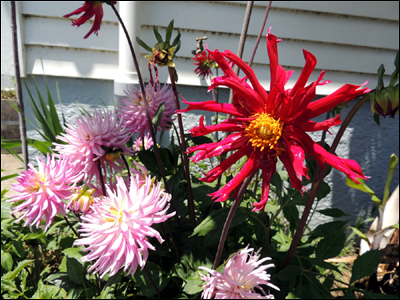 I’ll finish with a photo of a couple of my dahlias. They are very pretty… this photo was taken a week or two ago, they don’t look so perky today, due to the lack of rain. Dahlias ‘Taratahi Lilac ‘ and ‘Apache blue’.